290 pages | 79 B/W Illus. China's agriculture and rural society has undergone rapid changes in recent years. Many poorer farmers and younger people have moved to cities, and yet China has an immense challenge to feed a growing and more affluent population. 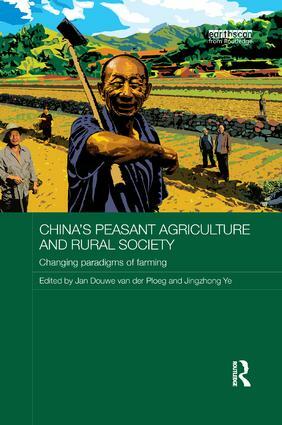 This book provides a ‘bottom-up view’ of China’s agriculture, showing how the many millions of Chinese peasants make a living. It presents a vivid description of the mechanisms used by rural households to defend and sustain their livelihoods, increase their agricultural production and improve the quality of their lives. The authors examine the newly emerging trajectories of entrepreneurial and capitalist farming and assess whether such alternatives will be able to meet the enormous social, economic and environmental challenges that China faces. The book also explores the paradigm that has underpinned the organisation and development of China’s agriculture from ancient times to the present day. This shows the importance of balancing in the Chinese model as compared to the one-sided imposition of continual modernization in the western model. It is argued that such balancing is at the core of the current Sannong policy, referring to the three ruralities of food sovereignty, wellbeing for peasant households and an attractive countryside. 8. Rural Women: Glimpses of Empowerment? Jan Douwe van der Ploeg is Professor of Transition Studies at Wageningen University, the Netherlands, and Adjunct Professor of Rural Sociology at the College of Humanities and Development Studies, China Agricultural University, Beijing. He is the author of the influential book The New Peasantries (Earthscan, 2008). Jingzhong Ye is Professor of Development Sociology and Dean of the College of Humanities and Development Studies, China Agricultural University, Beijing.